Do you think you would have been able to tell the difference between these two sneakers on the street? This Skechers knockoff of the iconic Adidas Stan Smith sneaker is adding fuel to the fire of a competitive rivalry between Adidas and Skechers. As consumers are increasingly choosing walking and “fashion-casual” shoes over running sneakers, Skechers has pulled into second place in the sports footwear market, with 5% of the market share, surpassing Adidas’ 4.6% share.1 Though running shoes are still by far the most popular type of sneaker in the U.S., the growth in Skechers’ sales—up 29% last year—has mostly come from its casual and walking segments.2 So it is not surprising that Skechers would want to rip off Adidas’ wildly popular Stan Smiths, and accordingly, Adidas has filed a complaint in Oregon federal court. The Adidas three-stripe design trademark is as analogous to the Louboutin signature lacquered red sole trademark, which was successfully held valid and enforceable by the Second Circuit in September 2012, where the court held that the contrasting lacquered red sole held secondary meaning and therefore serves an aesthetic function, which means that the red sole is essential to the use or purpose of the shoe.11 This holding makes sense because the contrasting red sole on shoes has become a symbol that consumers associate with Louboutins. The test that courts use for trademark infringement is a consumer confusion test, which means that the court may look at a number of factors, including: (1) the strength of the mark; (2) the proximity of the goods; (3) the similarity of the marks; (4) evidence of actual confusion; (5) the similarity of marketing channels used; (6) the degree of caution exercised by the typical purchaser; (7) the defendant’s intent.12 Adidas probably has a strong case, as the Skechers Onix sneaker looks very similar to the Adidas Stan Smith sneaker, with the only major noticeable difference being the location, number, and pattern of perforations on the side of the shoe. 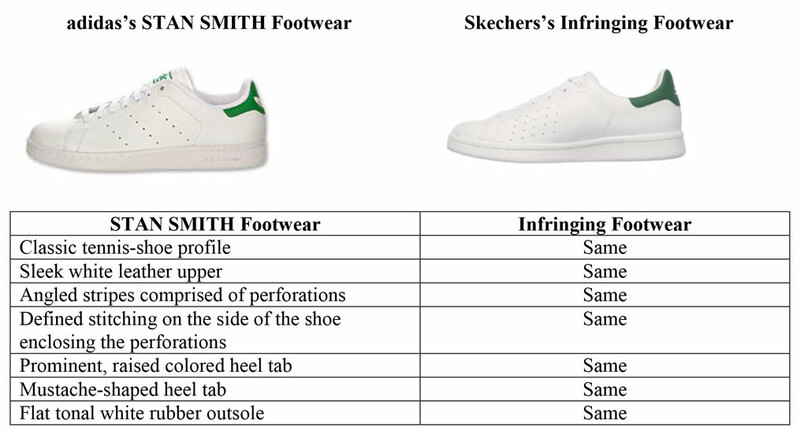 Additionally, there is evidence of a bad faith intent established by the source code on the Skechers website linking searches for ‘Adidas’ or ‘Stan Smith’ to the Skechers Onix sneaker. The reason for having a trademark is to protect a brand, an identity, the value of a product, and the consumer. Sketchers, by creating an Adidas Stan Smith knockoff, is not only taking a stab at the Adidas brand, identity, and the value of its Stan Smith sneakers, but it is also confusing consumers who may see Stan Smiths worn all over the world and think that they may be Skechers when they see them in a store. Regardless of which party prevails in court, it is important to consider where you would draw the line between knock-offs and novel designs, especially in the fashion world, where designers often strive for innovative designs, yet knock-offs are far too common. Bryan Rahmanan is a second year student at Fordham University School of Law and a staff member of the Fordham Intellectual Property, Media & Entertainment Law Journal. He has prior experiences in brand licensing and is fascinated by the intersection between intellectual property law and fashion.